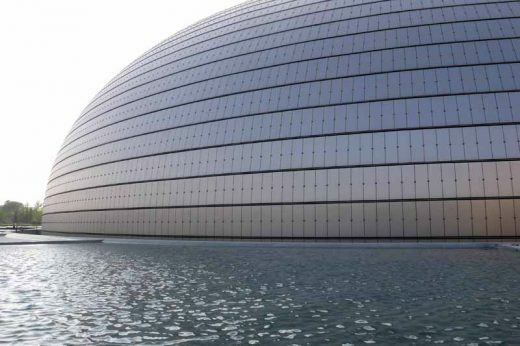 The Beijing National Grand Theatre: a cultural island in the middle of a lake. 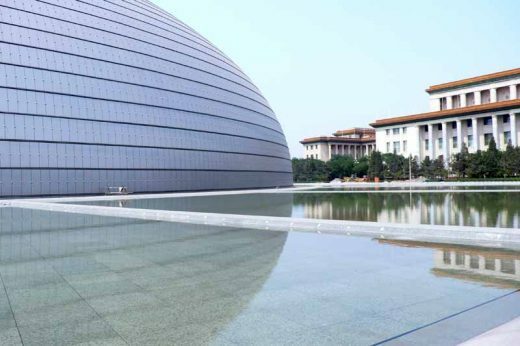 The building is situated in the heart of Beijing on Chang An Avenue next to the Great Hall of the People and about 500 meters from Tian An Men Square and the Forbidden City. It is a curved building, with a total surface area of 149,500 square meters, that emerges like an island at the center of a lake. The titanium shell is in the shape of a super ellipsoid with a maximum span of 213 meters, a minimum span of 144 meters and a height of 46 meters). It is divided in two by a curved glass covering, 100 meters wide at the base. During the day, light flows through the glass roof into the building. At night, the movements within can be seen from outside. The building houses three performance auditoriums – a 2,416-seat opera house, a 2,017 seat concert hall and a 1,040 theatre – as well as art and exhibition spaces opened to a wide public and integrated into the city. The building is connected to the shore by way of a 60-meter long transparent underpass. This entrance leaves the exterior of the building intact, without any openings and mysterious looking while providing the public with a passage from their daily world to the world of opera, fiction and dreams. The opera house is covered in a gilt metal mesh. It is opaque over the walls and when the areas behind it are unlit but it becomes partially transparent when there is light in such as way that it reveals what is there while creating a distance. The spectators enter the opera house through one of the two big doorways in the gilt ring wall. When they cross this threshold they penetrate into a world of vertical circulation that takes them even farther away from the outside world and draws them near the point in time and space when the show will begin. From the lobby, they are still visible in the distance created by the partial transparency. The wall thus expresses closure and separation but also, and more significantly, the psychological and symbolic distance that has to be crossed to gain access to the world of theatrical conventions. The whole project can be defined as a play on successive envelopes, passages and crossings, transparency and light. A lounge on the highest level under the roof affords the general public and theatre-goers alike with a view of the city all around that varies at different times of the day. From here, the city can be rediscovered from a hitherto unseen perspective. The decision to build the Grand National Theatre in a place of such historical and symbolic import clearly testifies to the importance given to culture in its relationship with history and the contemporary world. In such a context, it was out of the question to make an obscure, less prominent building of lesser importance. But neither could it pretend to be an isolated structure onto itself. For this reason, we strove to create a building that shows respect for the buildings around it, each of which marks in varying degrees the history of architecture in China, but that demonstrates the vitality of modern architecture by being as bold as they were in their day. We have sought to achieve this harmony through a combination of modesty and ambition, agreement and opposition, and have made improvements at every stage thanks to the valuable comments and suggestions we received. 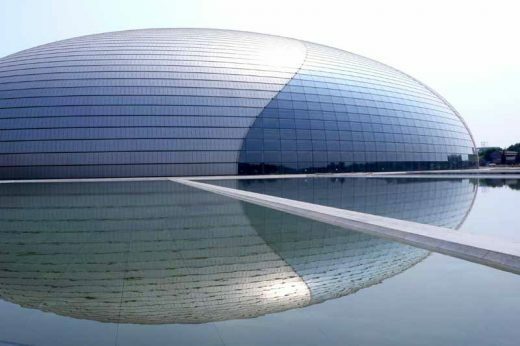 But we never lost sight of what we considered essential from the start: that the Beijing National Grand Theatre be part of the fabric of the city, a theatre in the city, a new district of spectacles and dreams open to one and all.